Imagine coming back from a tough day to find the finest smoking gear waiting for you to roll one up and smoke one. Doing so will allow you to unwind and enjoy your herb or wax in style and comfort. Most of us would never think of buying a monthly cannabis subscription box. Too many are a waste of money and unreliable. Others send low-quality gear that you could buy at your local head shop. And unless you are part of a pot club, chances are you not sure which is best. This guide that will save you time and extensive research finding the very best 420 subscription boxes available for yourself or as a stoner gift. Which weed subscription box should you choose? Take your time to look through each one to see which suits your needs. After reading this guide you do not have to feel regret or disappointed in a bad box. Filled to the brim with so much swag you can hardly close the box once opened. We do not know how they manage to provide so much for the price which puts the DHC’s El Primo at the top of our list of stoner boxes and our personal favorite. A great value boxed with a lot of papers and essentials. It is a starter box so do not expect any glass or anything fancy, but these are always packed with more than enough to get those that love rolling through the month. 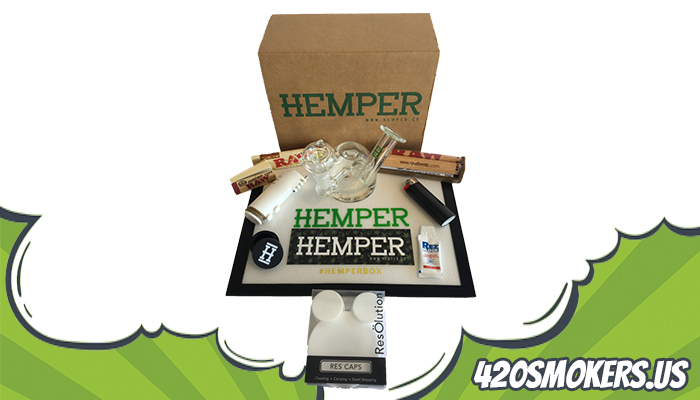 The Hemper Glassentials is one of our best rated boxes. Why? Simply put, the value of the glass alone is worth it each month. Anything extra is a bonus. Oh, and there is a lot of bonuses! Worth the price of the stoner T-Shirt alone, the Cannabox is a cool stoner box. It contains a lot of really fun gadgets and items you may not find in other boxes though may leave you light on essentials such as rolling papers. 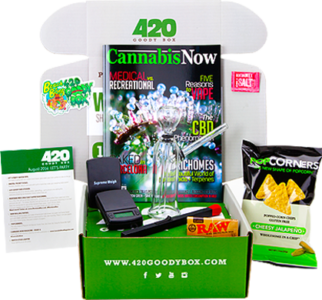 The 420 Goody Box offers great value and some awesome exclusive items every month, though not every month’s box is that exciting. 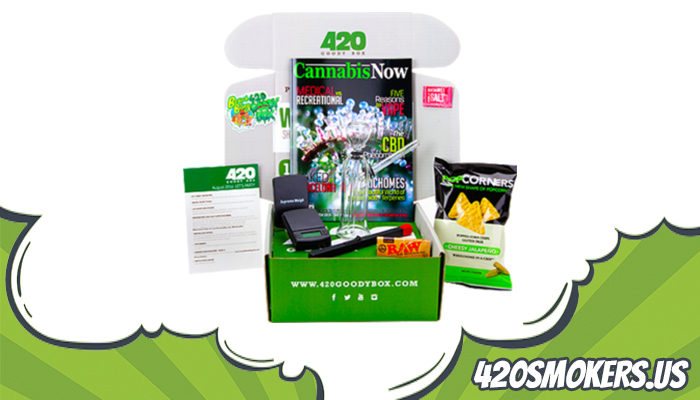 The 420 Goody Box is an all round cool box that will leave with some great little gadgets and help you slowly fill your shelf with stoner swag. The Puffer Box has a great variety of goods to keep you happy though the high may not last too long as it contains very few essentials to last throughout the month. The 420 Loot box contains some cool items for an entry level box. But do not expect it to contain everything you need to smoke for an entire month. This 420 stoner box makes a great gift for those that do not smoke every day. The concept of a monthly cannabis subscription box might sound highly unusual at first glance. But it often works out far cheaper in the long run. It is perfect for people who want to save time and convenience, instead of having to go to medical dispensaries or source each individual item locally. The following are seven of the best weed subscription boxes available. Number one on the list is the monthly El Primo subscription from the Daily High Club. 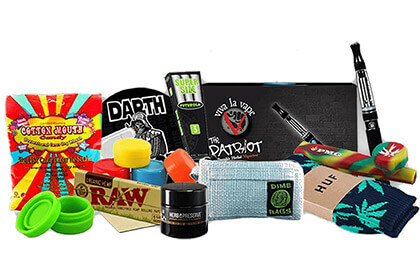 This box is packed with everything a pothead could possibly want. It has a wider range of items than any other stoner box, featuring high-quality glass and futuristic smoking materials. Despite retailing at $30, the box contains materials worth over $80 and is created by cannabis experts. Regular smokers would do well to invest in this high-quality box. Pros: The El Primo weed box comes brimful with the best value for your money. You'll receive more items than in any other stoner subscription on the web. Cons: Product or brand placement in form of blatant advertising material. Why we like this one: The Daily High Club connect cannabis enthusiasts around the world with a monthly subscription packed with the greatest smoking supplies typically delivered to your door. This is the perfect start toolkit, packed to the brim with papers and smoking materials. Experienced cannabis smokers might be a little disappointed with the lack of sophisticated items contained within, but are still getting a range of valuable items. It contains more items compared to most other boxes and retails at a tiny $12, a large part of why it is Instagrams favorite smoking box. It also comes with free shipping and the Daily High Club (DHC) pack it with new materials every month so its beloved customer base does not get bored. At $12 it is impossible not to love this box, and it is one of the most well known stoner boxes on social media. 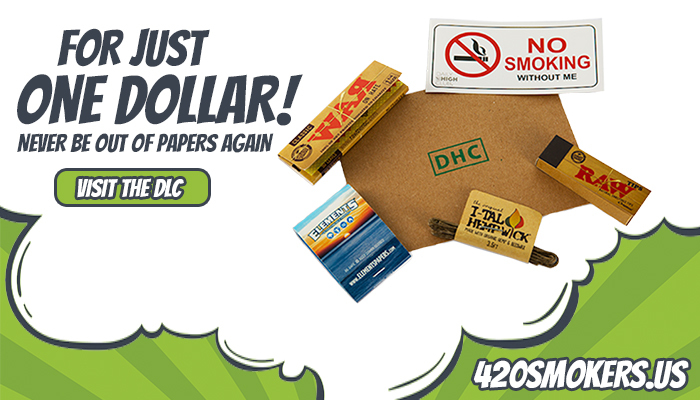 Pros: Cool stoner items and great rolling gear for just $12 per box. A monthly pack curated by cannabis experts for the global cannabis community. Cons: There's no glass or vape pen in this starter box. You'll mainly receive papers and essentials. This beginner pack won't be enough for a real pothead. Why we like this one: The Connoisseur box from the Daily High Club is the cheaper version of our best rated El Primo subscription box. For just $12 you'll never have to go to the store again to get your papers or essentials. This pack is the real deal for beginner and joint smokers. This box stands out primarily, but not entirely, due to the quality of the glass. But this is not to say it does not come with many extra bonuses. 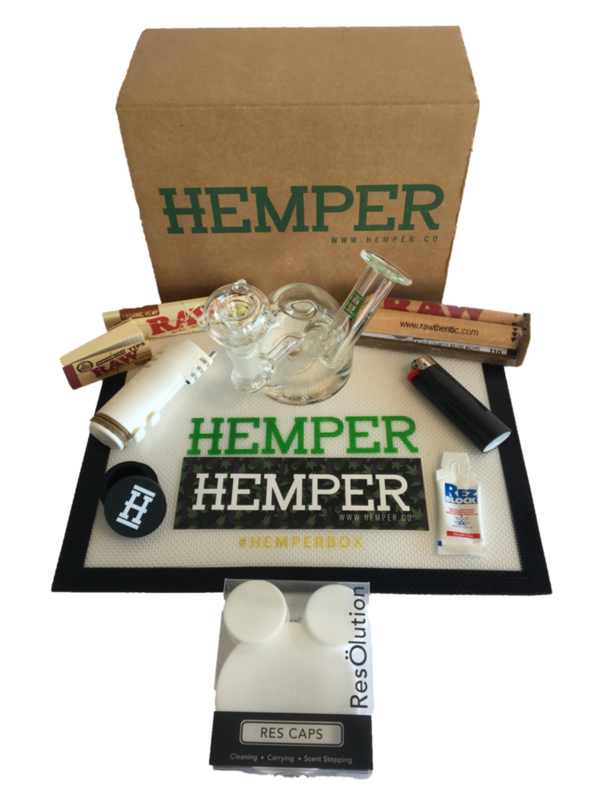 Hemper is a recognized company and the box features cleaning materials, smoking gadgets, papers, and glass of a very high caliber. Like the DHC El Primo this box retails around the $30 mark, and the cost of buying each item individually would be around $80. Hemper can always be relied upon to deliver good boxes on time, having an excellent reputation and an active customer support team. They are always looking for customer feedback and ways to improve their products and services. Pros: In a Hemper box you'll find these unique branded items that often haven't seen daylight before.´Also, there's a high quality glass piece in each box. Cons: Their monthly themes are not always for all stoners. If you are a heavy joint roller keep in mind that this box might not have enough essentials for you. 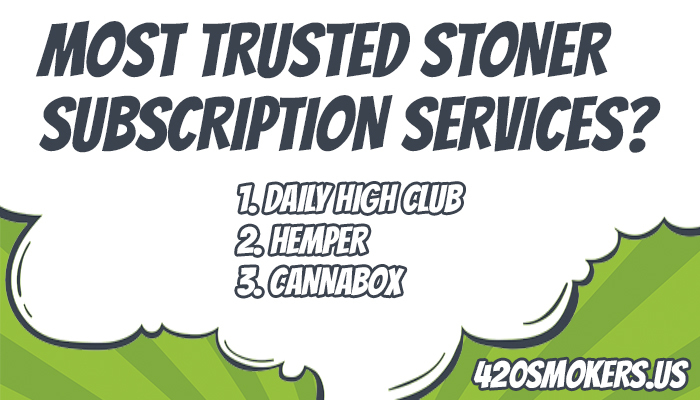 Why we like this one: Hemper is one of the most trusted 420 subscription services in the US. Their box is full of high quality products and curated by professionals. The Cannabox is more of a novelty buy than a functional purchase. The T-Shirt alone can make it worth the money, but it also comes with a number of novelty items which are not typically found in physical outlets or through online merchants. It comes with items that have yet to come to market and such as grinders, stash bags, papers, vape pens, and munchies. Heavy cannabis smokers might find the box a little light, but it is definitely suitable for most people with an interest in cannabis-related shows and culture. It also includes items from well-known brands. Pros: In this box you'll find cool things that you may not find at your local headshop. The Cannabox is coming with exciting themes and special items. Cons: There's a quality stoner t-shirt in each box but the designs are not fantastic. Cannabox will leave you light on essentials such as rolling papers. Why we like this one: Every Cannabox contains fun gadgets and products that are worth the price. Each box comes with at least double value and special edition items. This box is just plain slick, a modern toolkit with some very modern smoking equipment. It comes with some awesome gadgets without compromising on price or functional use. Retailing at $21, it also comes at a very agreeable price. The box includes magazines, novelty items, munchies and more. It is an exciting purchase and is the favorite stoner box for many. Many of the items are tailor-made from known brands and are not available from ordinary stores. For people looking for an exciting box to share with friends, this is one of the best there is. 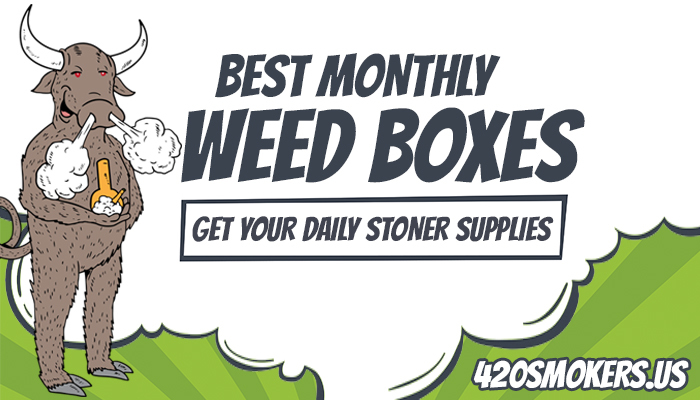 Pros: A monthly stoner box with awesome smoking surprises and a 100% money-back guarantee if you're unhappy. This subscription comes with everything you need to enjoy your daily session. Cons: Their monthly themes are not very exciting every month. Sometimes the 420 Goody Box comes with 1-2 pointless items instead of enough essentials. Why we like this one: You get a good selection of smokin’ gear, munchies, swag, magazines and much more! In every Goody Box you will find at least one awesome glass product or vaporizer. Despite being light on many essential products, the Puffer box has a wide variety of items that will keep all smokers engaged. Everybody appreciates pure glass products, and the Puffer Box does not fail to disappoint in this regard. One of the biggest selling points of the Puffer box (aside from the glass and good standard of materials included) is the variety of items. While it may not last the month, it is the perfect box for glass lovers, retailing at $25. It is also an ideal box for people who want to try out a first-time subscription. Pros: Gorgeous glass, special items and munchies. 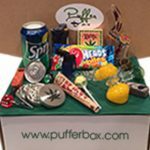 The Puffer Box comes with a great mix of items direct to your door. Incredible value for a small price. Cons: Some months don’t feel like as much value as others. Why we like this one: We can recommend the Puffer Box to beginner smokers which are always in need of essentials and smoking accessories as well to stoners who like to collect quality glass products. The loot box is a steal at just $9.99. It is neatly packaged and contains a wide assortment of smoking essentials. On the other hand, it does not contain enough product to last anywhere near a month and is a starter pack with very few items contained within. It is ideal for smokers who constantly run out of papers (.i.e all smokers) and is a good starter kit for first timers. Either way, it is not really possible to go wrong with a $9.99 purchase and it can be kept at hand in case of emergencies. 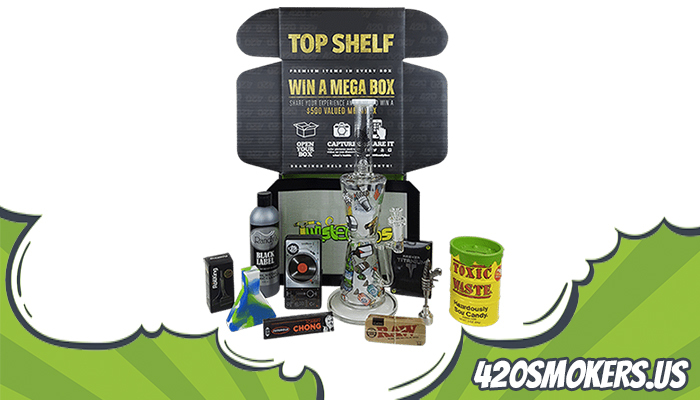 Pros: The 420 Loot Box comes every month with great packaging and promos for their followers. Another great service that puts double the value in each box. Cons: Another box which is not super exciting every month. Why we like this one: The Loot Pack is for joint rollers which tend to be often out of papers. 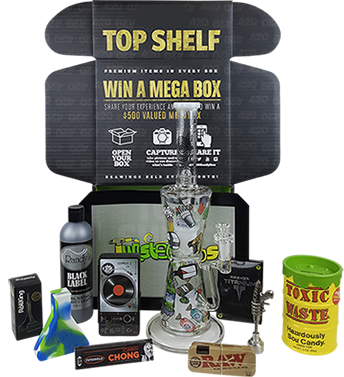 Each month you will receive an great weed box with 4 – 8 different items. When looking at weed subscription box services it is best to think about the amount you smoke and how much you normally spend on smoking accessories. Most boxes come with about double the value but often are packed with some items you may not use regularly, so it is always good to keep that in mind. Some boxes are tailored towards glass and vape smokers while others may be more for those that like to roll joints. So make sure you look at the boxes and previous months to make sure you like the products they sending out. A great way to see the previous months boxes is to check on Instagram and find the #tag for the box. Cool A F – The fact that you getting some cool stoner gear every month that you would probably never buy yourself is awesome! Too many times have I stuck to the same brand of papers for years before being introduced to something new. Now that time is over as I have a wide variety of smoking accessories, papers, glass and vapes to blaze any which way I please. Always Stocked – If you choose a box that suits your smoking needs, often it will be all you need. After awhile I find I have more than enough papers, glass, and vapes to get me through the month of toking hard! Trendy – Most weed subscription boxes come with the latest and greatest gear and are the first to introduce it to the market. This will make you the first to receive it. Whether you love blasting pics of the latest gear on Instagram or simply being one step ahead of the smoking curve, a box is definitely for you. Save Money – Smoking subscription box companies often get huge discounts from companies wanting to promote their produce and so they can pass on the savings to you! You will usually get a lot more value than if you where to buy the products bundled in marijuana boxes alone. Some monthly subscription boxes for smokers are focused more on those that use glass bongs and others for those that roll. There are even dab subscription box services catered to those that enjoy concentrates. Others focus on the culture and cool little gadgets and pop culture items. Are stoner monthly boxes any good? – For the cost of them, they are pretty good. Look for companies that have a good social media following and have plenty of happy customers posting pictures of the boxes to see if you like them. 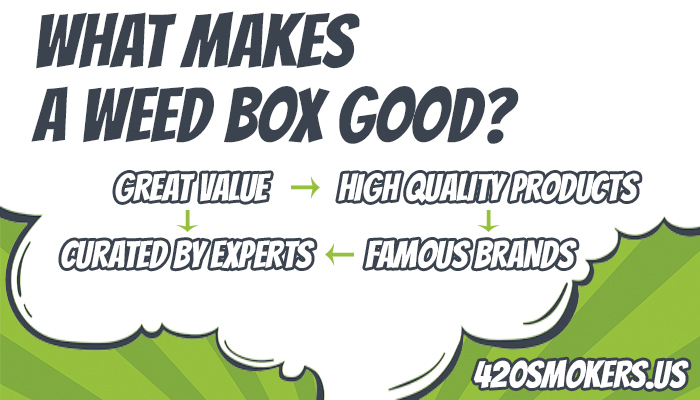 How do 420 subscription box companies provide so much value in a box? – Other companies usually provide box companies with products at below cost to promote their brands. These box companies sometimes even get the products for free! Can I buy more than one box? – Yes, you can order as many as you like. The companies are making a profit and so will sell you as many subscriptions as you would like. Are stoner subscription boxes legit? – Most are legit, though some do close down so it is best to take a short subscription of only 2- 3 months or pay per month for your stoner box. What are popular stoner subscription box brands? – The leading 420 subscription box services are The Daily High Club (DHC), Cannabox, 420 Goody Box, and Puffer Box. Why should I buy a 420 subscription box? – Apart from the savings, most boxes are filled with a few items you may never think of buying but have always wanted to try out. This is your chance. – You can buy one directly from their respective website. Simply follow the links in this review. So which is the best subscription box? – We recommend Daily High Club as they fill their boxes to the brim and add an extreme amount of value in each box. They a trusted name and we do not see them closing down anytime soon. Subscription box services are everywhere and stoner boxes are awesome. With the laziness that is often associated with blazing, it is nice to get a curated box of goods every month to restock the stoner cupboard.